Not all beacons are iBeacons. iBeacons are better. Beacons broadcast (generally Bluetooth) unique identifier numbers. Apple provides support for iBeacons by recognizing them and knowing their range. Apple will continue to monitor for beacons if an app is not running. Make your feature compelling enough to get the user to turn on their bluetooth and location. You get one chance to ask for permission, choose wisely. iBeacon monitoring is actually quite battery efficient, but the tech media has been telling people otherwise. Make sure your app clearly indicates the battery efficiency and encourages them to leave bluetooth on. Protect your users’ personal info. Beacon regions count as location, even if it’s latitude & longitude. Bluetooth beacons are radios. Radios are messy. Test and calibrate the signals to ensure the best signal reliability. Signal conditions vary over time, deployment locations, and manufacturers. These are just some of the challenges in beacon-enabling an app, but we’re here to guide you through them. At Kinvey, we recently built an app for Gluecon – a conference for cloud, mobile, and big data developers – to facilitate meetups between attendees based on both common interests and proximity (which was determined via beacons). Despite being an experienced iOS developer, I encountered some challenges that I hadn’t previously due to some unique traits of beacons. The following is a more detailed description of how we encountered and solved these challenges. 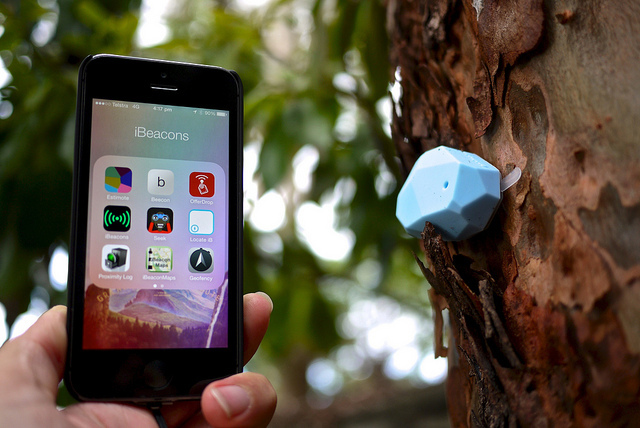 We hope you’ll be able to learn from our experience and make great iBeacon-powered apps. From this list we had to narrow down our booth-based use cases because we weren’t able to source enough beacon devices to have one per booth. When choosing features, it’s important to keep in mind that when the app is in the background, even if it’s killed, the device still monitors for the presence of beacons (this is known as region monitoring). Only iBeacons can be monitored in this way; if you use another type of Bluetooth beacon, the app needs to be active to search for them. Also, support for Android and other mobile platforms is still emerging by the open source community, so it’s hard to plan any particular cross-platform feature set. 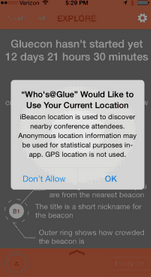 Another challenge of using iBeacons is that the user needs to grant location permissions in order to use the feature. On top of needing the permission, an app has to be aware that only certain devices support the beacons and device’s Bluetooth has to be turned on. This means there are several states for the app to check before beacons can be successfully used. “Location Services” is the overall checkbox in the “Privacy” setting. “App Authorization Status” is the result of the user pressing allow/deny in the location permission popup. This is shown automatically when the location is first requested. Beacon region monitoring depends on having BLE, Bluetooth turned on, and having background capabilities enabled. If the app automatically takes an action when the user approaches a beacon, such as a museum exhibit, point-of-sale system, or conference room, you can let the user manually select their spot from a list. If an app is based around sharing location, allow the user to control when that information is shared. For example, our conference app has a timed “Incognito” mode, where the user can choose to temporarily stop sharing location. This way they don’t have to leave the app to disable permission and maybe never resume sharing. Many apps are developed as closed and nicely-behaved systems; either a button is pressed or not, an item is found in the database or not, etc. 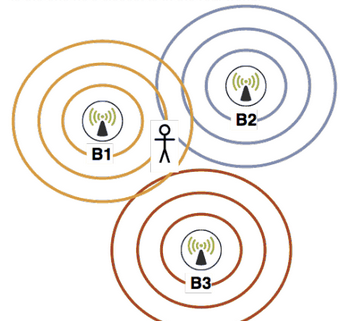 But when using beacons, you have to be aware that you’re dealing with external radios. Fortunately, the iOS SDK deals with all the intricacies of detecting the signals, decoding, error correcting, etc, and just presents the beacon identifiers in a CLLocationManager callback. Implicit in this procedure is that the device is making a best guess at what it perceives the beacon’s distance to be based on the difference between measured and broadcasted power and changes in the signal over time. The measured value is affected by how the radio waves bounce around the room, and, importantly, is very much affected by the big fleshy bags of water known as users. The bluetooth LE spectrum is also in the same spectrum band as WiFi and other wireless devices, which can interfere with the signal. And most unfortunately, the signal quality depends on the broadcasting device (and we’ve found quality to vary wildly among manufacturers). Beacon signals are affected by temperature, device power, the difference between described power and actual power, and polling interval, which may vary from broadcast to broadcast. What all this boils down to is that signal accuracy is highly variable. This is why the SDK describes the distance in gross categories: Immediate, Near, Far, (and unknown). Along with this value the accuracy and power measurements are provided to the app in order for it to make the best choices when determining when to act on this information. Fortunately, when using beacon regions for monitoring entrance events, this is pretty easy – once the device detects the beacon it’s considered inside the region (and some beacons can broadcast tens or even hundreds of meters). Exiting a region is a bit more complicated, since the device can’t rely on just missing receiving signals, as broadcasts can get dropped in good conditions. Therefore it can take several minutes after the device leaves the broadcast zone to be considered outside the region. For our use cases it wasn’t enough to just know which region the app was in, since the regions overlap (there are multiple beacons in the broadcast zone). We wanted to know which of multiple beacons is the “nearest”. “Nearest” is in quotes because this is a best guess based upon the location information provided by the SDKs. This involves comparing all the beacon range measurements over time to find the find the one with the best accuracy and closest measured distance. We used Kinvey (obviously) as the glue that links beacons to their real-world location, users to beacons, and users to users. Our app has one data collection that lists each beacon with its short name, UUID, major and minor numbers, as well as some metadata, like its location on a floor plan. These are pulled by the app when it launches. When the app encounters a beacon, it looks up the beacon’s document from this table and displays the appropriate context to the user. In addition, we also update the user object with the beacon identifier and timestamp in a “last beacon column.” Then we have a business logic script that the app can query to get a list of all the users at a beacon. This script filters the data for privacy and tries to interpret what “at the beacon” means. 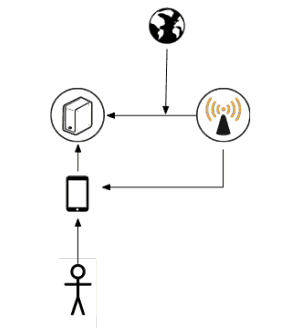 Determining presence at a beacon is tricky in the real-world because update events might not make it to the server and because beacon ranging can be dropped by an iOS device. Our business logic uses a time-based heuristic to guess if the user is reasonably still there. That is, if the user was last recorded at the specified beacon within a short (5 minute) window and didn’t move to a different beacon, the user is counted as actively at the beacon. The application shows a list of nearby users. This list allows the user to see the nearby users along with their interests. If there is a match, they are able to message each other to meet up and discuss cool technology. This messaging is done through yet another data collection, and Kinvey brokers the updating of each client and sending push notifications to the device. 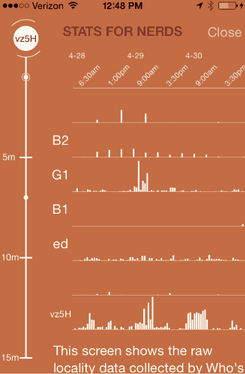 In addition to the real-time data, unique visitors are binned with a separate set of business logic scripts to provide the data for the bar graph view. This allows us to observe trends, perform statistical analysis and draw conclusions. In our original design we wanted to be able to determine the “most popular” booths at the conference. But with the scaled back app we will be able to observe the most popular presentations in the breakout rooms. It’s important to explain clearly what the app is doing, both in the public description and in the review notes. We were asked for a video demonstrating the use of beacons in the app, since they weren’t able to set up our mock conference floor. We used the Reflector app to capture a screen video and Camtasia studio to annotate the video. We included a link to the video in our review notes. We provided a demo account and some beacon UUIDs in the review notes to help the reviewers. Since the app uses background location monitoring, we had to include a battery use disclaimer in our description. “Continued use of GPS running in the background can dramatically decrease battery life. Using beacons in an app requires managing user expectations and permissions, coding defensively against unpredictable hardware conditions, and providing a way to link the beacon identifier with something useful in the application. Using iBeacons introduces a bunch of messy moving parts, and it’s important to follow the best practices. We hope you’ll be able to learn from our journey. You can check out the source code for our app at https://github.com/KinveyApps/Who-s-At-Glue, and our iBeacon management library at https://github.com/KinveyLabs/KCSIBeacon. Happy coding!